When you log on to Office 365 you’re functioning in the ‘big wide world’, and Microsoft wants to know who you are. This means that logon IDs have to include an externally valid domain (the one you have registered and verified within Office 365) along with a unique username within that domain. By default, Office 365 uses what’s called the User Principal Name (aka the UPN) to achieve this. So the first thing you need to do when you migrate to Office 365 is to check that you have a UPN suffix that matches in with the external domain you’ll be using for Office 365. Any internal routing names such as HQ and 'local' mean nothing to Office 365. In this example, HQ.domain.com would become domain.com – something that would be easy to fix with the Active Directory module in PowerShell. What about what’s to the left of the @ sign? As you can see from the examples, you may have a mix of different username formats. This can depend on when the users were added and the conventions of the current administrator. You might also synchronise usernames and other attributes in from another application, such as an HR system. In our example, Sara would logon as SaraA@domain.com and John would logon as John.Smith@domain.com(which just so happens to be his email address). But herein lies the problem. 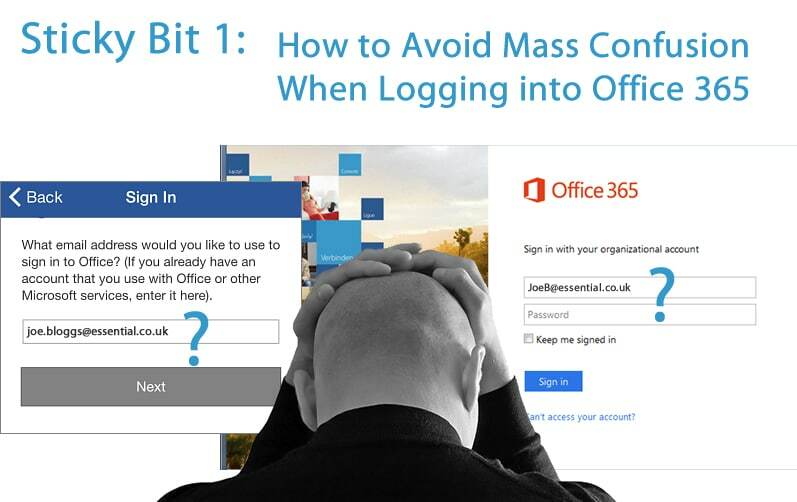 Because the Office 365 UPN is formatted like an email address, and for some, but not all your users, it may actually be their email address, confusion reigns supreme. This confusion is compounded by the fact that, for example, the Activation window for Office Pro Plus prompts the user to enter their email address. Likewise the iOS versions of Office and OneDrive prompt for email address. In these examples Microsoft and Apple really mean ‘UPN’ and not 'email address'. The upshot of all of this is that, although your UPN and SMTP email address aren’t necessarily one and the same, when you migrate to Office 365 you are best advised to make UPNs match users’ SMTP addresses. That way, you’ll save a heck of a lot of support calls. The tricky element is identifying non-matching UPNs and SMTPs and with organisations expanding every day, the number of occurrences can continue to increase. Something that can help and a product that we use and recommend during migrations is Mailscape 365. Mailscape 365 will continuously track all elements of your Microsoft infrastructure. It also creates detailed on-demand and scheduled reports on virtually anything you're interested in. An example would be the Office 365 non-matching UPN & SMTP report (available instantly from a web browser or as a scheduled email) which will clearly show every user with a non-matching UPN and SMTP. To see Mailscape 365 in action and to find out more, click here. 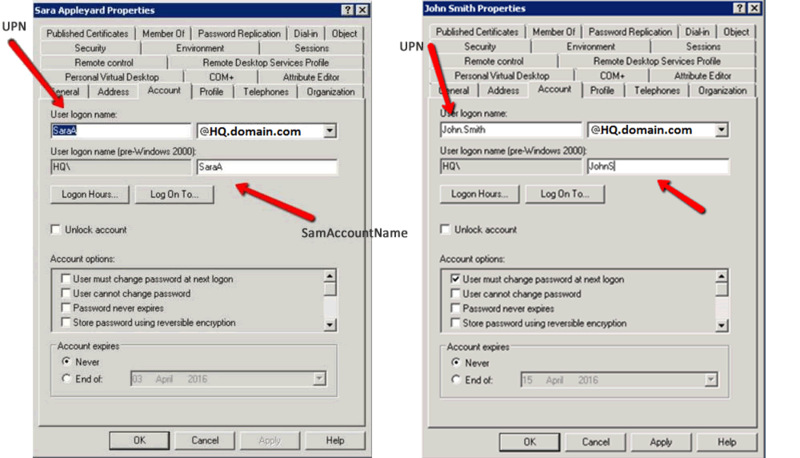 One final note: Although it is also possible to set up what's called an Alternate Login ID to cover for the fact that users will get confused, or that you may have an umbrella Office 365 domain for multiple subsidiaries with different email addresses, or you have legacy applications that mean you cannot change the UPN, there are caveats to using this feature – especially if you have a hybrid environment. There’s some useful articles by Joe Palarchio and Steve Goodman that explain more on this subject. Mailscape 365: Monitoring & reporting to get you out of sticky situations.